This is second lesson of Deploy WordPress Site on domain tutorial. This lesson assumes you have created your own domain. You have ordered for hosting space and decided to use WordPress. In the first lesson we discussed domain names in details. In case you missed that lesson then it is better to read that first. That lesson will help you create good domain name for your website. In case you already have domain name with you then you can proceed with this lesson. This lesson also assumes that you have working knowledge of WordPress. That is you know how to install WordPress themes, plugins and navigate through WordPress dashboard. It also assumes you familarity with WordPress terms. In case you are not familiar with WordPress then you can read the beginners guide first.Beginners guide will provide in depth details of WordPress.It describes each and every option from scratch. After reading that tutorial you can proceed with this one. This series assumes you have installed WordPress on your domain. Now it is time to configure your site and get started. Note the moment you have installed WordPress on your server and are live you should configure your site. There is high risks involved if you do not. People may hack your site. You will lose data and will have to rework again. So we will focus on securing WordPress installation first. Note WordPress is secure framework. But minor tuning is important as soon as you installed it. wp-config.php file is first thing you should secure. Most of the sites are compromised because of this very loop hole. There is only one step required from your side to secure it from most common attacks. This should be first step you should take after installation. In WordPress root directory ( the directory where you installed it look for a file wp-config.php). Make the file permission of this file 600. This makes it invisible to outside world. With this step you have secured your site from basic attacks. Your website does not have any useful content as of now. So it is better to hide it from visitors. Once you are online you are public by default. So instead of offering blank page so random visitor you can display Coming Soon page. The coming soon page informs visitors that website is not yet live. Work is in progress. It will be live soon. Note new website hardly have any visits. So you may think what is need of having Coming Soon page. There is one more aspect of offering Coming Soon page. You are disabling every functions of WordPress behind Coming Soon page. This gives you time to configure your site as per your need. Once you are ready you offer your site to public. Offering half baked site to public is not good idea. Now lets see how to put your website into Coming Soon mode. We will use plugin for this purpose. I assume you have read the WordPress beginners tutorial and is aware of Plugin installation process. Install this plugin on your site and activate it. After activation you will see page as shown below. Note below image shows only this plugin. If you have other plugins installed then it will show them as well. Now click on the Settings links as shown in above image. It will lead you to Plugin Configuration page. On the plugin configuration page you will see options as shown in below image. I have shown most important option in below image. Click on the option Enable Coming Soon mode and save the settings. This will put your site in coming soon mode. 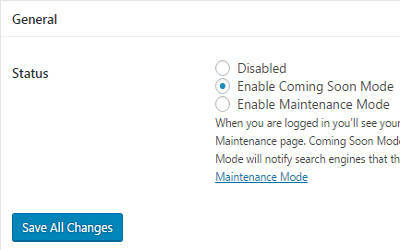 If you select option Enable Maintenance mode then your website is in Maintenance mode. We will discuss maintenance mode in this article as well. Note after above change if you visit your website then you will see blank page. Later in the article we will see how to populate meaningful message on the page. Since we are discussing Coming Soon lets discuss Maintenance mode as well in this article now. Above we see plugin provides two options Coming Soon and Maintenance mode. Maintenance mode puts your site in Maintenance mode. It says visitors that website is being maintained. For example You want to use separate theme on your site. Then you can put your site into Maintenance mode. Image it like servicing of your car. If your car has some problem then you go for servicing. Similarly issues like server change, theme change and website change may force work on your site. During that period your site should not be accessible to visitors. Then you should put your website into Maintenance mode. This informs visitors that site is being repaired. It will be available soon. Coming Soon mode is applicable if your website is new. You have not created any content. It is brand new site which will kick off after some days. Maintenance mode is applicable is a established site is undergoing some changes. So if your website is live for some days or months then coming soon mode should not be used. You should always use Maintenance mode. So for clarity use Coming Soon mode if your website is brand new. For old sites always use Maintenance mode. The things discussed in this article is applicable for coming soon page as well as maintenance mode page. Headline – Headline is bold title on the page. You can give your Website name along with Coming soon word here. For example I would give something like Udinra Tech Coming Soon. There is no rule here. You can give anything as per your choice. Message – In this area you can enter images and videos or text content (words) providing some insight about your website content. This section should be used to provide information about website (for example website theme). If I am creating Education site then I will provide details on that. Note you should always mention a tentative time line by when site will be live. You should make it bold and highlighted. Logo – You can upload logo of your website. Headline – You can give message like Your website is under maintenance is going awesome changes.I personally use Busy Making Udinra Awesome place for you or kind of message which sounds interesting to visitors. Message – Here you can give idea of feature you are adding. You should also give a timeline by when maintenance mode will be over. You can leave other options provided by the plugin as they are. The default options work pretty well. So there is no need to change them. In case you are interested you can change and see the impact.Rest of options define the look and feel of the coming soon or maintenance page. Note there is Header Section having SEO options. It might be tempting to fill this information. But there is no real need of doing that as of now. You can safely skip them. Now that we have coming soon page in place. It is now time to focus on your website. Before starting with your website you must clean up this. I would recommend deleting the posts and pages. So that you have no posts and pages on your site. Note deleting the post and page will remove the comments as well. You can also delete the plugins. Many recommend using Akismet on your site. But I prefer using different plugin for SPAM control. So you can remove Akismet.But I would recommend keeping the themes. You can remove the themes once you have identified theme for your site. Till them it is fine to keep the theme in place. So in this lesson we secured your site. We have also informed every one about launch date. We have also cleaned up the site. Now it is ready for next steps. In next lesson we will see how to prepare your website for content creation. The steps discussed in this lesson and next ones are mandatory for all types of website. We will cover specific site type creation (like eCommerce sites) after covering the General steps. Previous Previous post: How to remove rel=”noopener noreferrer” from WordPress? Next Next post: How to remove Serve Scaled Images issue from website?